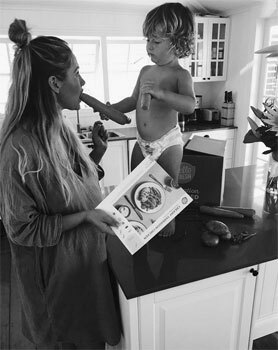 Ruby has just shared the imperfect moment with her son Rocket to show mums around Australian that life isn't all about the perfection that is often our social media feeds. Like many parents out there, Ruby knows that there is nothing you're really prepared for until you have a toddler. Whilst Instagram generally shows the clean houses and smiling kids – there's a lot of tough and sometimes hilarious truths in raising toddlers. Ruby has gained a global following on social media through her original and genuine posts travelling the world and documenting her life raising Rocket. Her candid snaps and hilarious Instagram stories allow a true insight into her world. Ruby is joining other parents in sharing their Toddler Truths, as part of the latest campaign for DUPLO. The campaign celebrates toddlers in all their glory as they develop and learn. On one hand this age can create tough moments for parents, and on the other amazing (and often very funny) memories. Question: How do you determine what you post on Instagram and other social media platforms? Ruby Matthews: Everything I create is either in the moment or created quite organically. I don't have the time to take a million photos and edit them then select. Generally, I choose an image that feels natural, has good vibes and flows within my feed. Question: How does your day differ to what you typically share on social media? Ruby Matthews: Obviously, I only share a short snippet of my day, but I find my pictures are generally a true representation of myself and my lifestyle. Question: Can you share some imperfect moments you've had with your son, Rocket recently? 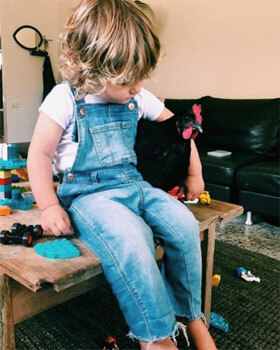 Ruby Matthews: Rocket recently decided it would be a good idea to bring our pet chickens inside to be play DUPLO with him, have you ever tried to clean chicken poo out of DUPLO?! But at the same time, it was lovely to see his caring nature come out with his two favourite pets pecky and ginger. Question: What advice do you have for a new mum spending a lot of time comparing herself to other mums on social media? Ruby Matthews: Spend less time on your phone and more time living in the moment, remember people only share the things they want to on social media, photos are edited, everyone is different for a good reason; life would be oh so boring if we were all the same! Question: How has social media changed your life? Ruby Matthews: It's allowed me to work from home and build my own label ROO Australia, it has also allowed me connect with so many amazing creatives. It's a constant source of inspiration. Question: What's a typical day like, for you living in Byron Bay? Ruby Matthews: I get up first thing and clean the house and make breakfast for Rocket and get myself ready and the car packed. I try and take him out once a day, it may be to the beach, park, coffee shop or grandpas farm. I find getting out of the house is the only things that keeps me sane. Whilst he naps I get through as much work as I can. We normally have a quiet play after his nap so I can keep on working. Then an early dinner and in to bed. But obviously we have our days when we're not quite up to it and eat cereal for breakfast lunch and dinner! Question: How are you preparing for baby number 2? Ruby Matthews: I'm fairly relaxed this time, maybe too relaxed! I'm currently 34 weeks and only have a few items, so at this stage I'm just taking each day as it comes and not over preparing. Question: Who do you look up to for parenting advice? Ruby Matthews: I feel I have very strong instincts when it comes to mothering and I do follow my gut, but I also ask my mother if I'm ever in doubt. Question: What products are you loving at the moment? Ruby Matthews: Well during and after pregnancy my skin breaks out and I can't recommend ASPECT skin products enough, I seriously swear by them! I also love Rabens Saloner the brand for all my pregnancy clothing!